Busy nights? No problem! 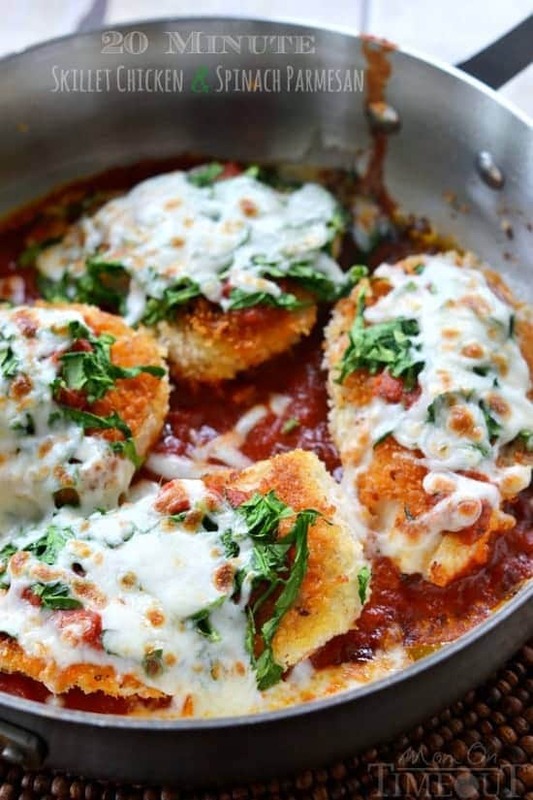 I’ve got you covered with this 20 Minute Skillet Chicken and Spinach Parmesan!. 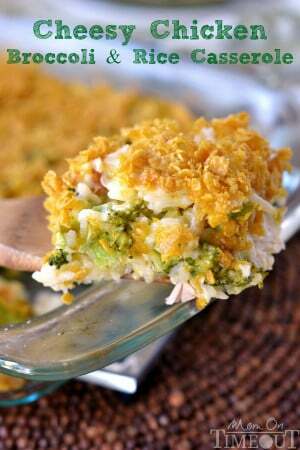 The easiest and most delicious dinner EVER! One that the whole family will enjoy! Swim season is here and the boys are having so much fun! It’s quite a time commitment but so worth it. The boys get such great exercise and they just LOVE being in the pool. It is an absolute delight watching Reece and Bryce swim their little hearts out night after night. And let me tell you, when they get home from those practices – they are hungry! We have practice every evening from 6 p.m.-7 p.m., but starting tomorrow, practice gets moved to 5 p.m. – 6p.m. As you can imagine, this makes dinner time a tad bit tricky. While I love using my slow cooker on busy nights like these, I’m not always so prepared 🙂 It’s then that I turn to quick, delicious meals like this 20 Minute Skillet Chicken and Spinach Parmesan. It’s packed full of protein and I can get it on the table by the time they finish showering and changing. Mission accomplished. Eating dinner together is super important to our family. No matter how crazy busy our schedules are, we can always count on mealtimes to bring us together to relax and enjoy good food and excellent company. Combine panko and parmesan cheese in a small bowl. Coat the chicken with the bread crumb mixture pressing gently to adhere. Heat 2-3 tablespoons of olive oil in a large, oven-safe skillet over medium-high heat. Remove chicken from skillet and pour half of the pasta sauce onto the bottom of the skillet. Gently lay the chicken on top. 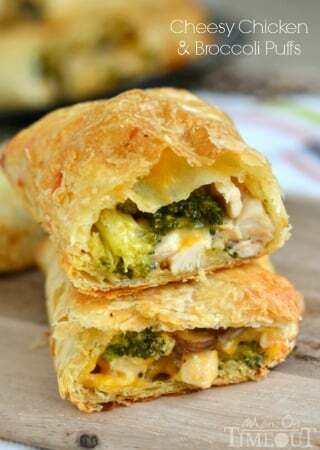 Place in broiler for 2-4 minutes until cheese just begins to turn golden brown. Whether I’m serving up spaghetti and meatballs, lasagna, or raviolis, my family LOVES it all with Ragú.Ragú has the Authentic Italian taste American family’s love and a variety of great tasting, quick and easy to make family favorite recipes. With 11 tomatoes in every jar, Ragú® Old World Style® Traditional Sauce is our richest, thickest recipe* ever! More of our favorite dinners! How can I adjust this recipe if my pan can’t go in the broiler? Just don’t broil it. Place a lid on to melt the cheese. I just wanted to say that I love this recipe-thank you so much for sharing! Even my incredibly picky sister will eat it (admittedly I don’t put spinach on her portion) and I’m about to make it for the fifth time already tonight! Thank you for the great and easy recipe! My incredibly picky sister even eats this and requested it for the second time last night! Do you have nutrition facts for this recipe? i tried this today… great recipe. I would be interested in the nutrition facts please. I just did some research…i think this will contain an average of 470 calories per serving. 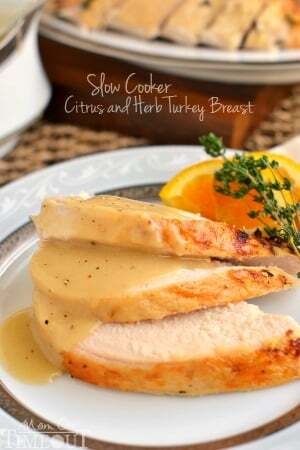 I’m going to make this tonight, any suggestions on sides to put with? I would serve with some buttered pasta and steamed green beans or broccoli. 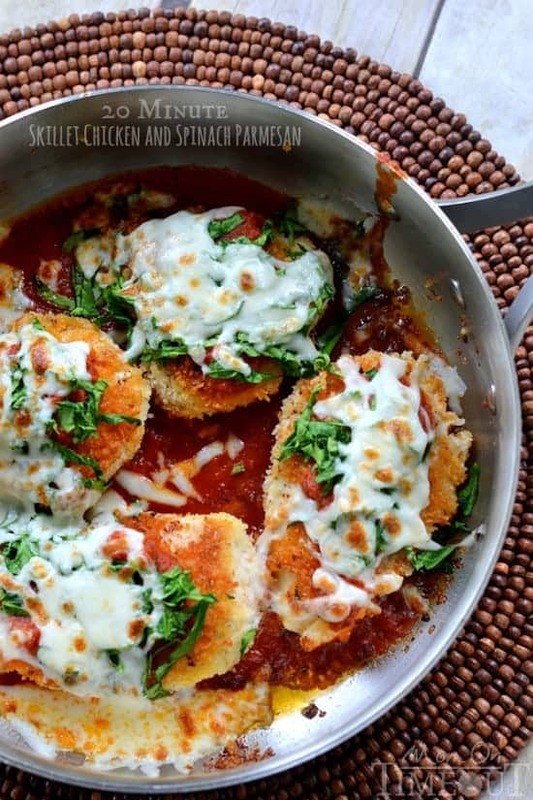 Thank you for sharing your 20 Minute Skillet Chicken and Spinach Parmesan recipe. I made it last night and we loved it. 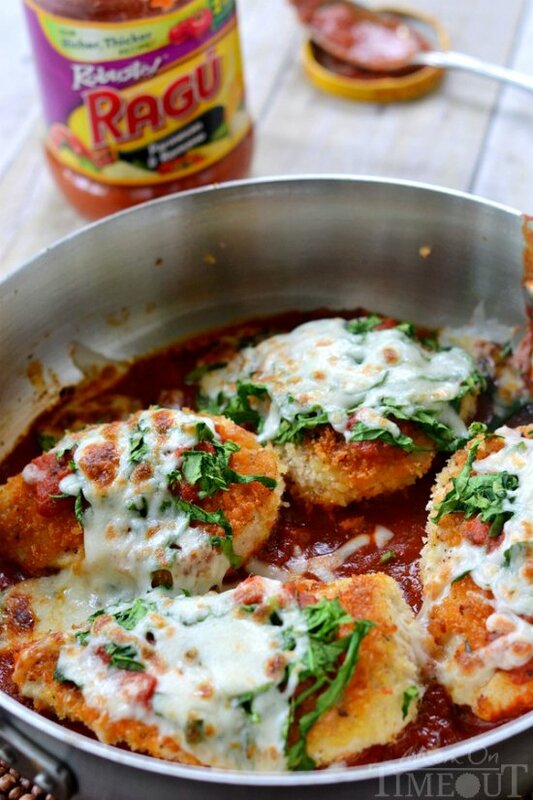 It’s so much better than any restaurant chicken parmesan we have ever had. 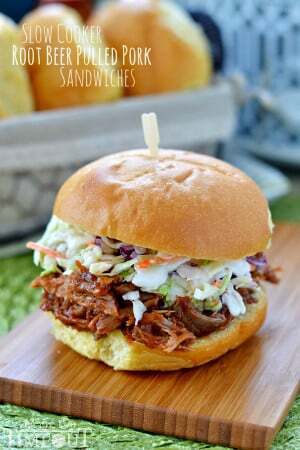 Easy, quick and DELICIOUS!!! That’s awesome Sandra! So glad you enjoyed it!